Most of the advertising records are 45’s, but there were also advertisement LP’s made. I prefer 45’s, but whenever I stumble upon an advertisement LP, I take it home too. Today I choose some advertisement LP’s with music of steel bands. I doubt if it were real advertisement records, by the way. 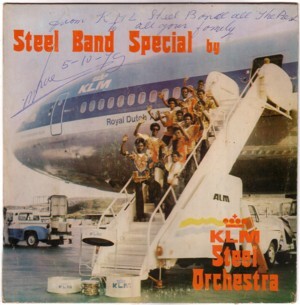 I think that the Shell and the KLM sponsored these steel bands, and that the records were sold to tourists. I have no idea how many of such LP’s exist. I have seen more than the three you can see here, and I guess that there are more LP’s than I have seen. And I am only talking about sponsored LP’s by tropical steel bands; god knows how many other advertisement/souvenir records exist on this planet! Some of the songs on these records were especially made for the occasion, which is one of the attractions of collecting advertising records; you get to hear music that you cannot hear anywhere else. 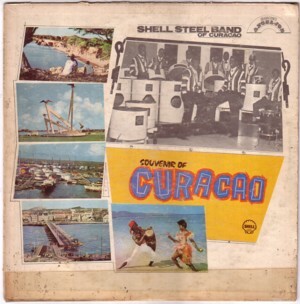 I am not really a fan of the typical traditional steel band music, but if you buy enough of such advertising/souvenir records, you always come across audio candy like this song: Groovy beat by the Shell Steel Orchestra. Interesting. 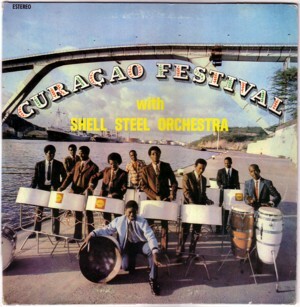 However there is such a wide variety of recorded (advertisement) steelpan music I’ll have to research what’s available.